Cafcass announcement on parental alienation - Nick Woodall - family separation practitioner, writer and parental alienation specialist. On 17 November 2017, a news item appeared in the Guardian newspaper suggesting that Cafcass was ready to tackle the problem of parental alienation in the UK. For those who don’t know, Cafcass is the statutory body responsible for representing children in family court cases and, as their website says, making sure that children's voices are heard and decisions are taken in their best interest. The report in the Guardian suggested that ‘divorcing parents could be denied contact with their children if they try to turn them against their former partner.’ It also stated that Cafcass are to trial measures to ‘prevent ‘parental alienation’’ and that these would ‘feature penalties including permanent loss of contact with child’ (a somewhat puzzling claim, as it is the judiciary, not Cafcass, that determines a child’s residence). Many people, not surprisingly, believed that this report heralded a major breakthrough in England and Wales. However, I’m afraid to say that, when you look behind the headlines, the Cafcass announcement, far from being something to celebrate, actually looks like an attempt to neutralise growing criticism of the way it handles alienation cases and to undermine calls for effective remedies to be put in place. That statement might be fine if it was coming from a clinical practitioner or legal professional, but it comes from an organisation that suggests in its High Conflict Child Arrangement Cases Handbook (the ‘tool’ Cafcass provides for family assessors who are dealing with children’s rejection of a parent) that there is no ‘scientific evidence’ for parental alienation, and states that ‘[s]seldom is the child’s alliance with Parent A and rejection of Parent B the exclusive result of one parent’s actions but of the conflict.’ It also prominently states that ‘[in] recent years parental alienation syndrome (sic) has been alleged in many cases where a child refuses to see a Non-Resident Parent (NRP) and it has drifted into popular use. In some cases by a parent seeking to exercise power and control over the other.’ Added to this, the recent Cafcass announcement talks about putting parents into ‘intense therapy,’ whilst not describing who these therapists will be or what training they will have undergone. 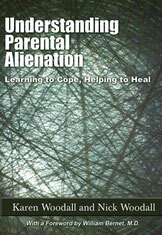 It should be noted that the first two papers argue that parental alienation does not exist. The third reference cited is a report prepared by a UK academic who, with Cafcass assistance, was largely responsible for torpedoing the UK Government’s family law proposals to create new enforcement powers in cases of contact frustration, in 2013. In it, she argues that contact frustration is not a result of implacable hostility but of conflict or ‘significant safety concerns regarding contact.’ It is, perhaps, worth noting that Professor Trinder writes on poststructuralist/postmodern feminism and research practice and has, for many years, been one of the UK Government’s select group of preferred academics used to research or evaluate proposed changes to family law. In the interests of fairness, I should note that the tool references Weir, K. (2011) High-conflict contact disputes: evidence of the extreme unreliability of some children’s ascertainable wishes and feelings. Family Court Review 49(4), pp. 788-800. Beyond that, there is a quick nod to Amy Baker in relation to children being unable to ‘openly express a wish to see the NRP.’ But none of the research that any serious examination of the problem would demand appears to have been taken into account and there has been no consultation with experts, either legal or mental health. The report in the Guardian claims that a trial of the ‘groundbreaking’ approach will start shortly, with fifty high-conflict families being sought across the country. After an evaluation in spring, the programme will be rolled out nationwide. Those of us who have worked in this field long enough will probably be able to identify the names of the academics who will be asked to evaluate the programme and could also probably write their conclusions too. As recently as 2015, a Freedom of Information request revealed that Cafcass does not use the term parental alienation, does not offer training specifically on the issue of implacable hostility and had not undertaken any research into parental alienation. Some people may hope that Cafcass has had a conversion on the road to Damascus. Sadly, it is my view that, rather than this being a ‘groundbreaking’ new approach, it looks more like an attempt to kick the issue into the long grass and prevent effective responses to the problem.